Mary Kay broadcasts targeted messages to employees and visitors using the OpenService solution running on Intel processors. “We essentially created our own TV station, called ‘Inside MK TV’, which shares content from our corporate intranet,” said Leigh Harrison, Manager of Employee Communications and Recognition, Mary Kay, Inc.
Mary Kay is one of the world’s largest direct selling companies with more than $3 billion in annual wholesale sales worldwide. Mary Kay’s skin care and color cosmetic products are sold in more than 35 countries around the world. Mary Kay sought a simple way to communicate with employees and job applicants at its two large facilities in the Dallas, Texas area. Their goal was to tailor information for different audiences, such as safety, culture and company news messages to employees; and company values, culture and information to job applicants. Having relied primarily on paper, intranet and email to communicate messages, the company was turning to digital signage in an effort to to extend their communication reach and speed up their time-to-message. For instance, they wanted to issue timely warnings, such as bad weather, fire or safety concerns, and connect with employees who didn’t have computer access and with “meeting warriors” – those who go from meeting to meeting and have limited desk time to read emails. Due to the many different factors, the digital signage solution had to be hosted offsite. The IT department supported this option and worked with OpenService to ensure the solution met Mary Kay’s technical standards. “A major factor was that the OpenService solution could be easily extended internationally, which was important because Mary Kay is a global company.” Leigh Harrison, Manager of Employee Communications and Recognition, Mary Kay, Inc. The OpenService solution employs AOpen DE67-HA media players to render multi-zone content on high definition (HD) displays. AOpen DE67-HA is one of the world’s smallest media players, and is built with high performance, mobile 2nd generation Intel Core processors designed with power saving features. The processors integrate Intel HD Graphics, which can be used for video conferencing, social media, interactive menu boards, kiosks, and HD movies. The AOpen DE67-HA uses Intel Active Management Technology (Intel AMT) to diagnose and repair Mary Kay signage systems remotely. Intel AMT can also be used to automatically power systems on/off during off hours to minimize overall power consumption or to track hardware asset information without physical interaction, even in a powered-off state. Security was a huge concern for Mary Kay, and content encryption was implemented as specified by the IT department. Mary Kay also requested the number of time slots be increased from three to four, allowing them to have more granular control over turning off the systems during non-peak time to reduce power consumption. Mary Kay’s global manufacturing plant in Dallas operates 24/6 and produces a good portion of the products needed to meet worldwide demand. For the corporate employee communications group, manufacturing was the ‘last mile of employees’, meaning they weren’t getting essential information from the company intranet, print media, and email blasts. As a result, a digital signage pilot was started with seven systems, three of which were placed in the global manufacturing plant: in the break room, main cafeteria and a gathering place called the coffee hall. The remaining systems were located at the global headquarters’ facility in three of the elevator lobbies and the HR lobby in view of job applicants. 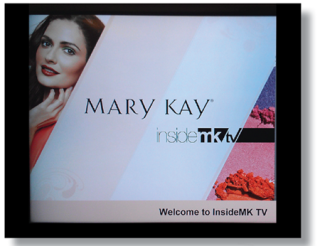 When the system went live, OpenService transmitted the content wirelessly over the Sprint network to the displays (via OpenService media players) located throughout Mary Kay. The wireless connectivity allowed Mary Kay to place the systems where they would be most effective and without installing hardwired network connections. A major portion of the project was content creation, for which OpenService worked together with Mary Kay to develop forty screen templates that automated the production and playback of content. Consultants guided the process of setting up the templates, suggesting how long content should sit, how much content should on the screen and how to organize the enormous amount of content. The templates were divided into zones to accommodate graphics, videos, photos, text, RSS feeds, news tickers, traffic and weather feeds. Since different groups, like manufacturing and HR, wanted to broadcast specialized content, some of the templates were customized. The work was captured in digital blueprint – a 100-page document stating what content is on each panel, font sizes, file naming conventions, etc. Custom graphics and backgrounds were created to highlight various company programs, such as wellness, social responsibility, green activities, corporate responsibility and the culture committee. Another visual element was a “photo story” that rotated through a series of images using a special template. The OpenService solution enables Mary Kay to automatically power-off systems after business hours, such as Sundays in the manufacturing plant, and weekdays between 7 p.m. and 7 a.m., as well as weekends, in the global headquarters building. The system uses Intel AMT to power on/off displays and their associated media players.